Every breath of the Brahmachari, every cell that breathes in a Brahmachari is for God, Supreme, the Self, the Great Self. The purpose, the joy, the beauty of the devotion of Brahmacharya is the seva of enlightenment. The Order of Sai Maa Brahmacharya is the monastic lineage of Her Holiness Sai Maa composed of devoted disciples who have taken lifelong vows and committed themselves to a Brahmacharya lifestyle of sadhana (spiritual practice) and service for global enlightenment. As a vessel of HH Sai Maa’s Presence and Shakti, the Swami, Brahmacharinis and Brahmacharis of the Order serve as a ministry in living, embodying and sharing Sai Maa’s teachings. The eleven members of the Order are located on four continents, and offer teaching programs and spiritual coaching, carry out humanitarian work, build community, and support Sai Maa’s global organization. Through the purity, devotion, and discipline embodied by its members, the Order is an energetic presence activating light consciousness around the world and inspiring others to live their potential as light. Swamiji felt love he had never felt before in his 44 years when he first saw Sai Maa approaching him in a town in the Berkshires of Massachusetts over 20 years ago. This was a true turning point for a psychologist, management consultant, and father who had suffered loss on many levels over the previous two years. Since that time Swamiji has flourished as a Bhakta, someone who progresses in the spiritual path through Bhakti or devotion, in this case as a disciple of his beloved guru, Sai Maa. Swamiji was blessed to be initiated in 2003 as a Brahmachari by Sai Maa and Sri Tiruchi Mahaswamigal, and four years later as a Swami by Sai Maa and Sri Satuwa Baba Maharaj. Through Sai Maa’s spiritual guidance and teachings, he has been able to apply his skills in teaching, coaching and writing, his fluency in French, and his love of traveling, to serve as a spiritual leader and mentor within the Order of Sai Maa Brahmacharya, and to offer teachings, coaching and spiritual guidance in two languages to Maa’s communities around the world. His love of writing has led to five books, beginning with his first, In the Path of Light with Maa, all of which have been published in English and French, with his first book also translated into Japanese. You can learn more about Swamiji, read his articles and listen to his recordings, by visiting his website at www.inthepathoflight.com and his blog at www.insidetipsblog.com. Our one-on-one spiritual coaching sessions offer personalized teachings and guidance for you to live your inherent spiritual potential, meeting life’s opportunities with awareness, clarity and wisdom--firmly grounded in the knowingness of your true essence. Drawing from their own dedicated spiritual practice, each Brahmachari coach brings to life a comprehensive background of spiritual wisdom to accompany you in your path of awakening and transformation. In a space of unconditional love, authentic reflection and a deep commitment to your evolution, your coach focuses on empowering you to manifest the state of consciousness you wish to live in. The foundational principle of our coaching work is that you are an embodiment of love and light, with the inherent potential to live an enlightened life experience. However, when these qualities are veiled by limiting thoughts, emotions, feelings and beliefs you cannot experience this true essence. Each session will support you in cultivating greater awareness, self-knowledge and inner discipline to transform and elevate anything that is blocking the full expression of your true Self. You will take away new insights, teachings, tools and/or practices that serve you to make new choices and create yourself and your life differently, thus impacting your spiritual evolution. The 45-minute coaching sessions take place on Skype or over the phone and are booked directly with your selected Brahmachari coach. Select a coach and session package to inquire about booking a Spiritual Coaching session. For more information on Transformational Coaching Sessions with Swamiji you may visit his website. Brahmacharya is a Sanskrit word which can be translated to mean moving toward or leading to Brahma. It refers to a path devoted to merging with or embodying the state of Brahma, in other words the Creator, Ultimate Reality, Supreme Self. Brahmacharya is a path of celibacy and self-discipline which frees one’s awareness, senses, thoughts and actions to be totally focused on the realization of the Divine Self. When one takes initiation as a Brahmachari (male) or Brahmacharini (female) in the Order of Sai Maa Brahmacharya, he or she takes lifelong vows to live a life of celibacy, purity, discipline and devotion to Guru. While the Brahmacharis and Brahmacharinis of the Order may be engaged in a wide range of outer activities in life, the inner focus of their being is always Self-Realization. Brahmacharya is a path that has been practiced for thousands of years in India, therefore when initiated, our Brahmacharis enter this age-old tradition as well as become a part of Sai Maa’s spiritual lineage and monastic legacy. Our lineage, emanating from Her Holiness Sai Maa, carries the spiritual influence of the Divine Mother, Avatar and Hindu lineages, and esoteric traditions. When a Brahmachari takes initiation, through a sacred ceremony performed by Sai Maa and Hindu priests, Maa pours into the Brahmachari the Shakti (divine feminine creative power) of these lineages. Maa is the embodiment of Mother Divine, the Devi (Goddess) whose primordial divine feminine creative energy underlies all of creation. Maa’s presence serves to awaken this divine potential within us, regardless of our gender, bringing greater expression of the pure love, compassion, and wisdom inherent in all. It is for this reason that in Maa’s lineage and community we use the greeting “Om Jai Jai Sai Maa” which acknowledges the presence of the divine feminine in oneself and the other. Maa is a great esoteric master whose many lifetimes of work dedicated to serving humanity’s spiritual awakening enrich the energies, teachings and wisdom which Maa embodies today. Maa will often speak of the Christ lineage and of Maa's gang including Ascended Masters, Angel Realms, and Cosmic Beings who work with and through Maa for our evolution. HH Sai Maa’s Beloved Guru, Bhagawan Sri Sathya Sai Baba, is the cosmic Avatar of this century. Through the Grace of Sai Baba and Sai Maa, the Order of Sai Maa Brahmacharya carries this Avatar lineage, that began with the incarnation of Shirdi Sai Baba, continued with Sathya Sai Baba, and will be revealed in the next incarnation as Prema Sai Baba. The transformative power of Shiva--the Hindu deity who is the manifestation of pure consciousness--is very active within Maa’s lineage. This energy of Shiva which Maa carries is expressed as an unshakable focus on divine truth and steadfast commitment to the purification and transformation of all. Maa also brings forth the ever flowing devotion and love of the Vishnu tradition which is known for its practice of bhakti, ultimate devotion for the divine. Guruji, a humble Shiva devotee and member of the Sadhu Society whose Binsar Mahadev ashram, situated in the middle Himalayas, centers around a powerful Shiva lingam that had been uncovered years before. Guruji was devoted to Sai Maa and our community as a spiritual father. Gurunathan who practiced Shabri Tantra and initiated some members of the Order into this lineage in his ashram in Kerala. Sri Sri Sri Tiruchi Mahaswamigal (Apaji) recognized and honored Maa as an embodiment of Mother Divine. Sai Maa and Apaji initiated Swamiji and Dayananda as Brahmachari at Apaji’s Kailash Ashram in Bangalore. Also, Apaji gifted Sai Maa and our community with the healing murti (statue) of Mariamma that now resides in Big Indian, New York with the Bodhivastu Foundation. His Holiness Jagadguru Sri Satuwa Baba Maharaj (Maharaji), a highly respected saint and successor of the over 300-year-old lineage of Satuwa Baba, loved Maa as part of one soul (he called himself Atmiyaji and Sai Maa Atmiji). Maharaji blessed our community with his presence and teachings about Krishna. Maharaji with Maa initiated Swamiji as a Swami, as well as others in the Order as Brahmachari. Among the many honors bestowed upon Sai Maa are the titles of 1008 Mahamandleshwar granted in 2005, and Jagadguru in 2007, by Maharaji and the Sadhu Society that goes back 5000 years. Sai Maa’s title of Jagadguru represents the first such initiation of a woman into the Vishnuswami lineage over the 2700 years of its history. 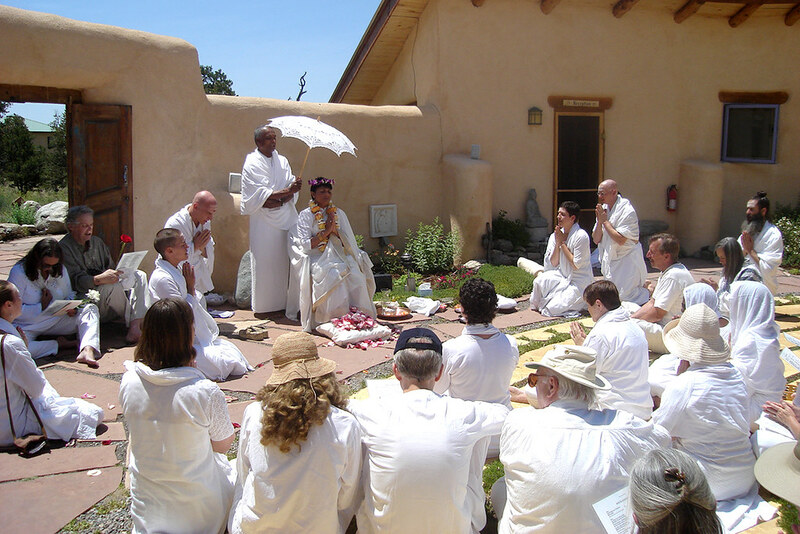 From 2004 to 2010, Sai Maa’s ashram (monastery) in Crestone, Colorado, USA was home to many of the Brahmacharis along with others who came on short and long-term retreat. Ashram life was centered on sadhana (spiritual practice), community life and seva (selfless service) in an idyllic atmosphere imbued with Maa’s divine presence. It was a time of deep practice, study and transformation for all. Before deciding to close the ashram Maa began to send her Brahmacharis to live around the world as ambassadors of Maa’s teachings and global mission. Sai Maa is currently in the process of building an ashram--Sathya Sai Maa Moksha Dham--in the sacred city of Varanasi, India to serve as the base of Maa’s humanitarian work and engagement in India. Growing up with a knowingness that spirit is present in all paths, Rajeshwari Maa has been inspired by a desire to nurture the underlying unity that exists within all. She comes from a diverse background, having lived in the USA, Japan and Germany from a young age. She studied at hotel and catering school, as well as in professional translation, and worked as a business manager at a large investment bank before moving into training for 5,000 hours in various healing modalities. Rajeshwari Maa is a passionate teacher with a talent for synthesizing complex concepts into practical and applicable knowledge. She views the physical body as an important vehicle for the awakening and ascension process, and has been teaching on healing and spirituality for over 20 years. Rajeshwari Maa has studied with Drunvalo Melchizedek, and brought him and the Flower of Life program to Japan in Japanese. She has trained with British Osteopath Hugh Milne in a three-year apprenticeship in Visionary Craniosacral Work, as well as in a four-year program with Osteopath Dr. Steven Weiss (The Altar of Creation). Rajeshwari Maa has also had extensive training in energy healing work with Rosalyn Bruyere, in Continuum Movement with Emilie Conrad and Susan Harper, and in various modalities of massage and bodywork. Sai Maa has been Rajeshwari Maa's guiding force on her spiritual and healing path for the past 15 years. As a Brahmacharini, Rajeshwari Maa's has dedicated her life to Sai Maa’s mission and currently lives in Tokyo with her 13-year-old son, where she has been instrumental in bringing thousands of Japanese people into Maa’s transformational work. As the Managing Director for Sai Maa Japan, her days are focused on spreading Sai Maa's work and teachings throughout Japan with a vision of serving the upliftment and transformation of the entire country. You may contact Rajeshwari Maa at rajeshwaridasi@sai-maa.com. Shree Devi Maa has been guided by spiritual wisdom from a young age, learning to meditate when she was five years old and attending primary and secondary schools with a curriculum based in the Vedic knowledge of meditation, consciousness, yoga, and Ayurveda. Through this background, she has become firmly grounded in practical spirituality--using spiritual knowledge and practices to transform the experience of everyday life. This is an important focus in her teaching, through which she educates others in using age-old practices such as meditation, pranayama (yogic breath techniques), self-awareness and energy mastery to help others live healthier, more peaceful and fulfilling lives. Meeting Sai Maa at the age of 22, Shree Devi Maa’s life has been formed by Maa’s loving presence and profound wisdom. Feeling a deep resonance with the one-pointed discipline and devotion of the monastic path, Shree Devi Maa took initiation as a Brahmacharini in 2006. Since that time, she has spent many years living in Sai Maa’s ashram, serving as Sai Maa’s personal assistant, running youth programs, and teaching online courses and in person workshops in the USA, Europe and South America. Born in Chile and raised in the United States, Shree Devi Maa returned to Chile in 2014 to expand Sai Maa’s teachings and global community to a new continent. Founding the organization VidAlineada, Shree Devi Maa has developed a practical curriculum focused on making Sai Maa’s universal wisdom available to a wide range of people. She teaches and offers spiritual coaching in Chile and Bolivia as well as globally to Sai Maa’s community. You may contact Shree Devi Maa at shreedevi@sai-maa.com. Achyutananda Das is a Neurologist specializing in Neurocritical Care, serving those with critical and life-threatening conditions. Since meeting Sai Maa in 2005, he has dedicated his life to global enlightenment. A teaching of Sai Maa that has greatly impacted Achyutananda Das is that God is within. For this reason, he chooses to serve humanity in remembering our true nature and embodying the divinity that we are. As a physician, Achyutananda Das is also devoted to helping us remember what it is to be whole and know that we are innately perfect, as this redefines our health and healing. Achyutananda Das travels throughout North America, Europe, and Asia offering a unique blend of spiritual and scientific teachings. In 2013, he was named as Successor for Sai Maa in the East. You may contact Achyutananda Das Brahmachari at achyutanandadas@sai-maa.com. A Hebrew mystic and devotee of Mother Divine, Dayanand Das offers workshops and spiritual coaching to awaken the ecstatic state of love that is our true nature. At the age of 22, he had the experience of creation as infinite love and light, sparking a lifelong spiritual journey. For over 25 years, he has studied esoteric spiritual practices from Hebrew and Hindu traditions, including Kriya pranayama, Kriya light work, mantra, and meditation. In 2006 Dayanand Das was initiated by Sai Maa with the title of Acharya, which means one who initiates or guides other into spiritual disciplines. Upon meeting Sai Maa, Dayanand Das instantly recognized Maa as the Divine Mother, as pure love embodied for the healing of humanity. Dayanand Das embodies and teaches the heart as a gateway to spiritual awakening, a state beyond mental understanding. A spiritual teacher for over 20 years, Dayanand Das has mentored and taught people of many ages and from various cultures. Starting as a teacher of Tai Chi and spiritual wisdom in Israel for seven years, he went on to become a Sai Maa Master Teacher, a teacher trainer for the Wisdom Teachings Program, a facilitator of year-long and weekend courses, and a mentor for young adults in the AWAKE program. Recently, he founded the Shiviti Center in Tel Aviv, offering spiritual coaching and leading programs in Israel and abroad including the Healing Heart and the Ancient Wisdom for Modern Awakening workshops. You may contact Dayanand Das at dayananda@sai-maa.com. A life-long avid student of nutrition, health, and energetic healing, Lalita Shree Maa has a passion for working with young people, particularly girls and young women. As a certified Somatic Experiencing Practitioner and Soma Source Practitioner, she has studied and practiced over a decade in the field of Somatic psychotherapy with an emphasis on healing trauma. She is also an artist, musician, and loves to dance and spend time in nature. After meeting Sai Maa in 2004, Lalita Shree Maa lived in Sai Maa’s ashram for over three years and was initiated as a Brahmacharini in 2016 at the Maha Yagya in Japan. She has been a Sai Maa Teacher for over 10 years, teaching around the world, and has worked in a leadership role for Sai Maa’s global organization since 2011. You may visit Lalita’s website at www.lalitashreedasi.com. Through an enhanced sense of the world as energy, Jayendra Das explores and teaches the systems of energy that define our lives. A teacher of Tai Chi, he offers workshops on movement, consciousness and meditation, demonstrating how we can become aware of and master our lives through the five elements. A student of Sai Maa for over 20 years, Jayendra Das has seen his life transform into a mission of global service, leading him to teach around the world including in France, the UK, Belgium, Ireland, Germany, USA, Canada, Turks and Caicos, and India. Prior to becoming a Brahmachari, Jayendra Das developed an expertise in ergonomics, physiological protection for pilots, organizational and program management, and advanced technologies. Starting as a pilot, he then became a technical and material engineer, and then an organizational leader in the French national aeronautic administration. Jayendra Das demonstrates a unique knowledge in systems and human management. Today Jayendra Das offers workshops, spiritual coaching, energy sessions, and classes aimed to awaken consciousness. He works in collaboration with companies in Montreal and Paris, offering a unique approach to leadership and management based on the energetic centers and the five elements. Based in France, Jayendra Das offers courses online and around the world in both French and English. You may contact Jayendra Das at jayendradas@sai-maa.com. In everything that Janardan does, he brings a pure devotion and desire to serve others. He has spent the last 20 years bringing solar energy to homes, businesses and schools in service of making renewable energy widely available to all. Motivated by his love of hands-on learning, Janardan began learning everything he could about renewable energy when he built his own earthship--a house built from all natural and recycled materials. Today he travels around the world consulting on numerous solar energy projects and is innovating a system of hands-on education for school children to learn about renewable energy through their involvement with the solar technology being utilized in their own school. Janardan met Sai Maa 15 years ago and felt an instant connection with Maa which has remained a constant source of guidance and upliftment in his life. In his first program with Maa, he experienced a state of profound oneness consciousness which awakened him to the potential within him. He took initiation as a Brahmachari in 2006, propelled by his desire to cultivate one-pointed disciple to serve his path of enlightenment. Whether it is in his work in solar energy, his service to Sai Maa, or the approachable and down to earth ways he shares Sai Maa’s wisdom, Janardan is truly an embodiment of service, committed to our global transformation. Meeting Sai Maa while in college, Anant Das’s life was destined from a young age to be one dedicated to spiritual awakening. His curiosity for exploring and understanding the world led him to study diverse topics in college, including film, finance, and yoga, eventually becoming trained as a yoga teacher. He continues to teach as a yoga instructor, having offered classes in prisons, universities and for school-aged children. After graduating from college, he went to live in Sai Maa’s ashram in Crestone, Colorado and within a year, he made the decision to move to Varanasi, India where he would support the activities of Sai Maa’s organization. Anant Das lived in Varanasi for five years, living at a Vedic school for youth, as well as helping to organize yagyas (fire ceremonies) and sacred puja ceremonies in Sai Maa’s ashram. In 2013, he was initiated by Sai Maa as a Brahmachari at the auspicious gathering of the Maha Kumbh Mela in Allahabad, India. Touched by the natural devotion of the Indian people, the powerful energy of Varanasi, and the spiritual wisdom inherent in the Indian culture, Anant Das feels truly at home in India. Today, Anant Das has returned to the US where he is furthering his studies and expanding his experience in the domain of whole child education. With a passion for developing education for young people that empowers them with self-knowledge and spiritual wisdom, Anant Das holds a mission to illuminate the next generation of leaders. He is now immersing himself in educational training, propelled by the goal to return to India one day to open an international school dedicated to the evolution of the next generation. Tyagananda Das, also known as Tyagabhai, has been a teacher for Sai Maa for more than 11 years. As the Event Manager for Sai Maa’s global events, Tyagabhai has had the unique privilege of being closely trained by Sai Maa, as well as addressing audiences of hundreds throughout the world. His authentic and passionate teaching style has allowed him to connect to people across various cultures and inspire them to make lasting changes in their life. With a background in the healing arts, Tyagabhai holds both Bachelors and Masters degrees in Psychology and has been professionally trained in communications and public speaking. Raised as a “devout atheist” through childhood, and educated in physics and mathematics in his undergraduate studies, Jivan Das’s spiritual journey has taken a truly circuitous path through a world of judgment and limitation. It was through years of living and working in the wilderness with at-risk youth, and spending countless days and nights on sheer cliffsides as a high-performance rock climber that he discovered a uniquely tender path towards his own heart. After realizing he desperately needed someone in his life to help guide him through the various difficulties he faced within himself, his life, and especially in romantic relationships, Jivan Das was introduced to Her Holiness Sai Maa. Even after meeting Sai Maa for the first time, he was slow to be convinced of the profound nature of this relationship and the greatness that would unfold in his life thereafter. Now, over ten years after that auspicious afternoon in Boulder, Colorado, Jivan Das has become a delighted and joyful member of the Order of Sai Maa Brahmacharya. He plays various roles and positions including Sai Maa’s Personal Assistant, Sai Maa Teacher, and lead developer of Light Legacy Institute’s Power of Patterns™ Intensive. As a passionate, transparent, and joyful teacher he engages his students with his tenderness and down-to-earth humor. Additionally, he works as a transformational coach with clients seeking to enhance and elevate any aspect of their lives. Finally, Jivan Das also works full-time as a clinical psychotherapist for a wilderness program in Durango, Colorado. He is an experienced practitioner of yoga, a high-performance rock climber, and avid backcountry telemark skier. You may contact Jivan Das at jivanandadas@sai-maa.com.